This report presents selected results from water quality monitoring at four mainstem Minnesota River locations and fourteen outlets of major tributary streams (streams draining watersheds greater than 100,000 acres). The information represents results from more than 4,000 water-quality samples collected from 2000-08. This Report highlights findings regarding excessive sediment, nutrient enrichment, and environmental health concerns documented in the Minnesota River Basin. 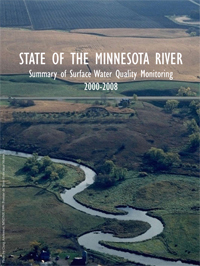 It serves as a companion document to the State of the Minnesota River, Water Quality Summary 2000 to 2008 pamphlet.